"This Copy of Windows is Not Genuine." How do I fix this problem? The most important thing to do when you get a dreaded “This copy of Windows in not Genuine” message is to stop panicking. It does not mean that a hacker broke into your computer and stole your license key. It does not mean that you are going to need to buy a new computer, unless of course you already needed one. Dealing with the problem means following a few simple steps to let Microsoft know that your copy of Windows was properly paid for. What just happened to the computer? Basically, there are two codes that are stored within Windows. One is the product key that comes with every copy of Windows. The second is provided by Microsoft that tells Windows that the first code is genuine and registered with them. This error means that one or both of these codes is missing or damaged. In short, re-entering these codes is what fixes the issue. There are a couple reasons why this could have happened to your machine. First, with Windows XP Service Pack 3 and later, Microsoft no longer required a product key as part of the installation process. This means that when you receive your new computer, you may still need to activate it. If you don’t you will get this error message after 30 days. You might also get this message anytime, if one of the two codes mentioned earlier gets corrupted. Finally, you usually get this message at some point if you actually have have a pirated copy of Windows. Look for the sticker containing your license key on the outside of your computer case. On most laptops it will be on the bottom, for desktops, it is usually on one of the side panels. If your copy was digital download or your copy is not genuine, you won’t have one of these stickers. What a Windows license sticker looks like. If you do have a license key, follow these instructions to activate you copy of Windows. Go to your Start Menu or Start Screen and search for “Activate Windows”. If you feel comfortable with keyed shortcuts, you can hit Windows+R and type slui.exe 4 and press Enter. 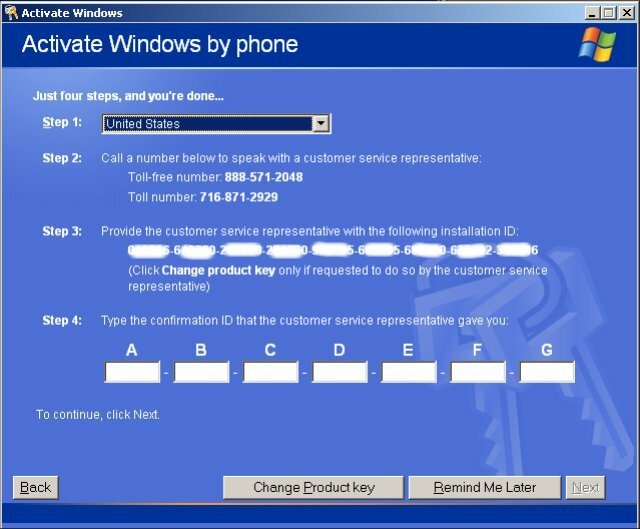 You can choose to activate Windows online or over the phone. If you have internet access, that method is much simpler, but you can call if you must. For some issues, you will be be required to call. Enter your license key to continue. If your product key won’t let you activate over the phone, you can continue with the following options as if you don’t have a valid key. If you do not have a valid key you do have a few options left. You can attempt to get a replacement key. If your copy of Windows came preinstalled on your PC, you will need to contact the manufacturer. You will probably need to provide them with some basic information like your serial number. Their tech support will be able to help you find it on the case of your computer. If you have a valid Windows disk, you can contact Microsoft directly to attempt to get a replacement key. They may ask several questions to verify your disk is genuine, but with a little talking, you can get your replacement key. If it turns out you do have a pirated copy, or you don’t want to deal with tech support, you will have little choice other than buying a new copy of Windows. Once you have your new disk, you can follow the above instructions to activate your copy. Make sure you get the right version in order to make the transition seamless. Activating Windows is very simple. All you need is a phone or internet connection, and a genuine license key. Even if you need a new key, you can obtain one easily, and your computer will continue functioning while you are working out your options.